Atkins(www.atkinsglobal.com)is one of the world's leading engineering and design consultancies, employing some 17,700 people across the UK, North America, Middle East, Asia Pacific and Europe. It has the breadth and depth of expertise to plan, design and enable some of the world's most technically challenging and time critical infrastructure projects. Atkins is one of the world’s leading engineering and design consultancies, employing some 17,700 people across the UK, North America, Middle East, Asia Pacific and Europe. It has the breadth and depth of expertise to plan, design and enable some of the world’s most technically challenging and time critical infrastructure projects. 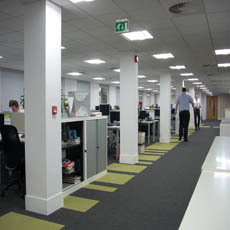 In 2009 Atkins completed a major refurbishment of their Derby office located on the RTC Business Park. At the heart of the refurbishment lay a commitment to delivering a sustainable low carbon building and an opportunity to showcase technical expertise to reduce CO2 emissions. This was achieved through a critical examination of the design, specification and construction phases of the project. • Waste was kept to a minimum and monitored throughout the project with 90% of materials recycled. • Key elements of the furniture, carpets, floors, partitions, ceiling tiles and windows utilised recycled materials in their technologies and construction. • The replacement of all windows has reduced noise, glare and heat loss. • The Dulux Ecosure range of paints were chosen as they have 25-30% less embodied carbon. • All white goods chosen achieved grade ‘A’ energy efficient. Atkins Remote Technology System monitors all energy use and measure performance in terms of preventive maintenance. • The cooling and heating system is 40% more energy efficient than conventional alternatives and uses natural ventilation to reduce the spread of viruses. • Cooling fans to the server cabinets have seen a reduction of around 10-15% previously required. • Passive infrared detectors control the lighting and daylight sensor controls. • High efficient diffusers reduce the number of fittings required, while daylight tubes and polarised lenses have improved the lighting quality. • Energy consumption is metered to calculate the energy CO2 footprint, and mileage was recorded for vehicles used during refurbishment. • More efficient use of space achieved with a reduction of 4,000 sq ft.
• Flexibility of design to future proof requirements with the option to expand by 27%. 70% of the total contract value of the works was undertaken by local suppliers. Excellent transportation links was a key factor in choosing the site.